By the mid-fifties, Mingus had a fearsome reputation as a bassist, but I wonder what people thought of him as a composer? We know he’d been writing since he was young, and his early output is ‘interesting’, but that’s perhaps all it is. He tried to emulate the swing sound of the forties, and didn’t seem to achieve the lightness of touch of the greats of that era; he wrote pop music, but there were others who far better at that than him. My guess is that his contemporaries had huge admiration for his bass playing, but were less impressed by his compositions- bemused, perhaps. But the music had been gestating within him for two or three decades (or possibly more, if you believe Mingus’s hyperbole) and, in ’57, it came out, came to fruition, exploded, in an intense eight-year period of creativity almost unrivalled within jazz, after which Mingus was so exhausted, he didn’t perform or record for several years. Think of it: in 1957, Mingus recorded several fantastic- classic- albums: The Clown, Tijuana Moods, East Coasting and the lesser, but worthy “A Modern Jazz Symposium of Music and Poetry” along with true gem Mingus Three. In one year! Yes, he took a year off in 1958 but then: 1959! Many say “Ah Um” was Mingus’s greatest album, but it wasn’t even his best album that year! That, of course, was Blues and Roots, with Mingus Dynasty also shining. These albums, for a lesser musician, would have crowned an entire career. Inventiveness and beauty poured from Mingus in the years that followed: Mingus Revisited, At Antibes, Charles Mingus Presents Charles Mingus, Oh Year, Tonight at Noon, The ’62 Town Hall Concert, The Birdland Broadcasts, The Black Saint and The Sinner Lady, Mingus Mingus Mingus Mingus Mingus, then, in ’64, many wonderful, truly wonderful, large-scale live recordings, reaching a peak- in jazz, not just for Mingus, in the early hours of 19 April 1964 in Paris, followed not long after by the triumph of Monterey…. …but preceded by Eric Dolphy’s tragic and untimely death. Look at Mingus’s output from ’57 to ’64. Every album is different! Not just different tunes, but a whole different outlook, and yet distinctly Mingus! We have the privilege, looking back, to view this period in context and, with this consideration, it surprises me not at all that he burned out sometime in 1965 or 1966. So, why 12 March 1957? Because, on that date, Mingus, along with newly-acquired drummer Dannie Richmond, Wade Legge, Shafi Hadi and that aristocrat of the trombone Jimmy Knepper, recorded “Haitian Fight Song”: to me, the first authentically Mingusian recording. Nothing before, for me, had quite fulfilled Mingus’s desires, and there was no period that followed in which Mingus, despite the odd mis-step, ever really let me down. 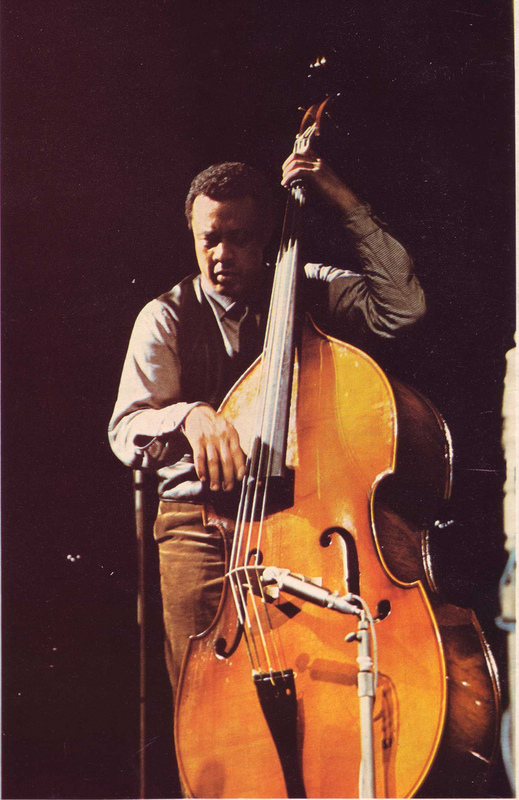 Fifty years ago, the Charles Mingus Sextet toured Europe. This tour represented a peak in Mingus’s career. It was a culmination of what he’d been striving for musically, with one of his strongest bands who could be trusted to accompany him in twenty-five minute pieces full of improvisation. Charles Mingus had Dannie Richmond by his side, his most trusted drummer, and the great Jaki Byard on piano. Jaki was a true virtuoso but exercised great restraint and produced incomparable blues. For Mingus aficionados, it’s great that most of this tour was recorded, but the show on 19 April (the doors actually opened on the 18th but the band took to the stage after midnight) is the strongest recording. It’s like a jazz ninth symphony, or perhaps a B-minor mass- minus a trumpeter, as Johnny Coles had collapsed the previous night. The tunes last at least a quarter of an hour each but maintain their momentum throughout, with stunning solos. Clifford Jordan plays melodies, not riffs, though was sometimes ridiculed by Mingus for not being loud enough. Mingus’s beloved Eric Dolphy was never on the receiving end of criticism. At the end of the tour, in late April and after Mingus’s 42nd birthday, the band went home, whilst Eric stayed in Germany, where he was to die in June. In September, in Monterey, Mingus performed a triumphant version of “Meditations on Integration” and I’m sure he was looking at the Californian sky and thinking of Eric. The second Mingus album I ever bought was called “The Wild Bass” but was in fact first released as “Mingus Three”. 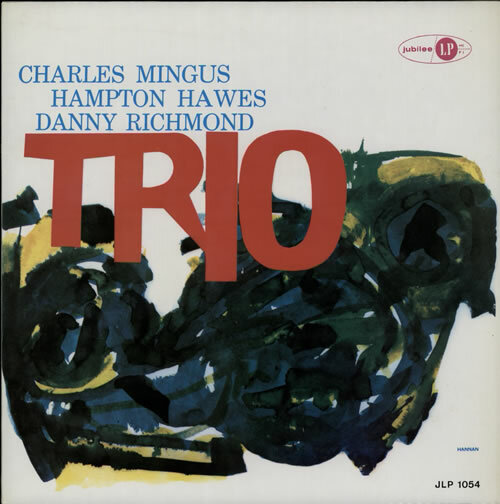 It’s a seven-track trio session with Richmond on drums and pianist Hampton Hawes. I would have been about 16 when I bought this album so that’s in around 1983. I’ve been listening to this album for thirty years: two-thirds of my life. I can’t really say that Mingus is the greatest bassist ever because I haven’t heard all the bassists in the world. I have, however, listened to lots of other music and musicians. Jaco Pastorius, of seemingly unlimited technique but inclined to be self-indulgent if not reigned in by Joe Zawinul or Joni Mitchell. At the other end of the artistic spectrum, Mstislav Rostropovich playing a Bach cello concerto. Mingus’s playing, as sideman or soloist, fires all the same neurons as the latter so, to me, he’s there alongside Picasso, Beethoven, Uchida etc etc. I have read Hamton Hawes’ autobiography, “Raise Up Off Me” and this session gets a passing mention. He was on the streets, desperate for drug money, and he bumped into Mingus who booked him for this session. You’d never think that was a drug-addled pianist you’re listening to: it really is some of the best jazz piano playing I’ve ever heard. The playing on this album is sublime. Hawes and Mingus play beautiful, complementary and memorable solos, particularly in “I Can’t Get Started” and “Laura/Tea for Two”, and Richmond fits right in. If this album was food, it would give you all your dietary requirements. Why write this? There are loads of Mingus albums available, many of which are repackaged reissues and it’s often difficult to know what you’re buying. What I’m saying is, this album is a little gem of twentieth-century music. You are currently browsing the archives for the Mingus category.